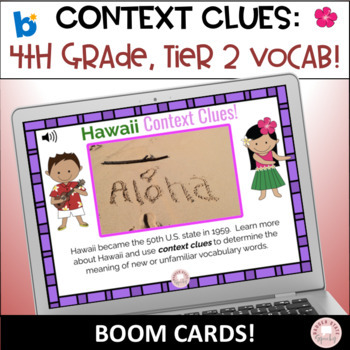 Hawaii Context Clues: fourth grade, tier 2 Vocabulary! 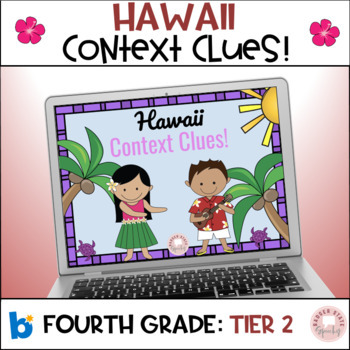 Bundle Hawaii Context Clues: Grades 4-5 Tier 2 Vocab! Have you tried Boom Cards yet? They are no print digital task cards that are interactive. Your students will love them! In this set, you will receive a deck of 30 cards. The first few cards teach students ways to find context clues in text. Then, there are 25 cards where students are presented with 1-2 sentences and an image of Hawaii. Within the sentence, there is a fourth grade, tier 2 vocabulary word in red. Students read the sentences, then choose the best meaning from three choices. For each tier 2 word presented, the students have three choices of possible meanings of the word, and they are given visual and auditory feedback about the accuracy of their responses. Real photographs of Hawaii are used! Click here for a playable preview of the deck! 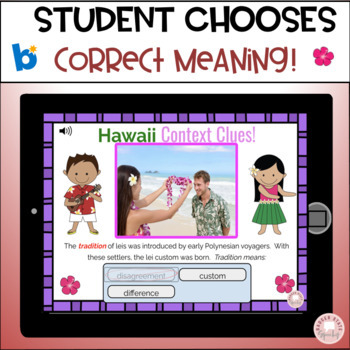 BOOM learning cards are a web-based, interactive platform that is self-checking with sound! ►When you download this product, you will receive a PDF with a link to the digital task cards on the Boom Learning Site. Click on the link. It will take you to the Boom learning site. Press redeem. Blog Post on Boom Learning. Boom Cards: On or Off Topic? Elementary Version. You might find this Pinterest board on digital materials helpful! If you purchase, please leave feedback at my store and you will earn TPT credits towards future purchases at ANY TPT store! ALL OF MY NEW PRODUCTS ARE HALF OFF FOR THE FIRST 48 HOURS. CLICK ON THE GREEN FOLLOW BUTTON TO BE NOTIFIED OF NEW PRODUCTS!